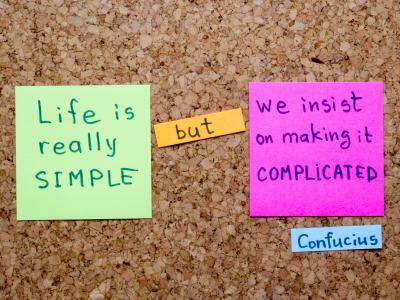 Long ago, Chinese philosopher Confucius said, "Life is really simple, but we insist on making it complicated." We think he was onto something, particularly as it relates to the so-called pay ratio requirement that spilled out of Dodd Frank. About a month ago, the SEC adopted a final rule that requires public companies to disclose the ratio of the compensation of its chief executive officer (CEO) to the median compensation of its employees "pay ratio." The new rule was mandated by Dodd Frank, as part of an effort to give shareholders more information when voting on "say on pay." The say on pay rules in turn, require public companies to give shareholders information on the compensation of the most highly compensated executives at least every 3Ys. Companies must ask shareholders to vote on the compensation of those executives. Top executives of the company are identified by the SEC as the CEO, the CFO and at least 3 other most highly compensated executives called "named executive officers." Under the rules, companies have the flexibility to call for a non-binding resolution that shareholders will vote on related to this group. While many community banks are not public entities, for those who are, the SEC notes they believe the new rule "provides companies with substantial flexibility in determining the pay ratio, while remaining true to the statutory requirements." The SEC requires public companies to provide the new disclosures for their first fiscal year beginning on or after Jan 1, 2017. The desire to hold down costs and the fact that Congress wasn't explicit in why it wanted this ratio, are some key reasons the SEC indicates the rule included so much flexibility. Of course, the problem with this approach is that the underlying idea of having disclosures is historically to create transparency in financial statements, so such wide flexibility may do the opposite. When applying the calculation, the SEC said a company will be permitted to select its methodology for identifying its median employee and that employee's compensation, including through statistical sampling of its employee population or other reasonable methods. Further, the rule also permits companies to make the median employee determination only once every 3Ys and to choose a determination date within the last three months of a company's fiscal year. Finally, while probably not a big thing for community banks, the rule also allows companies to exclude non-US employees from countries in which data privacy laws or regulations make companies unable to comply with the rule and provides a de minimis exemption for non-US employees. Passage of this rule has raised some concerns about the possibility of larger financial institutions undertaking efforts to temporarily boost shareholder return through tactics such as stock buybacks. Another criticism of the rule is the fact that companies are being charged with determining their own relevant employee groups to find their median employee, making any meaningful comparison between the final ratios across any specific industry all but impossible. For major banks and securities firms, calculating these ratios will be labor intensive and the results are likely to further ire groups focused on income inequality. For community banks, where the pay ratios will be significantly smaller than those of their largest competitors (and where overseas employees are all but nonexistent), the new rule will be just one more headache and additional cost that heightened regulations have created. Nonetheless, community banks would be wise to begin planning how they will approach this new requirement starting in 2016, to avoid any unpleasant surprises. For us we have to wonder what the value is of this ratio when at its most basic level, it will be almost impossible to compare across industries and it takes 294 pages to explain one calculation. Clearly this is a much more complex issue than it seems and yet again one more thing at least public community banks will have to deal with in an already extremely difficult operating environment. Perhaps Confucius may have known our Congress would create overly complex banking regulation when he said, "Never give a sword to a man who can't dance." Treasury yields rose 4bps, after the uncertainty of an interest rate increase in 2015 was eased by Yellen's hawkish speech. If you are feeling bad about how much you have saved for retirement, it is interesting to note that studies find the median retirement account for near-retirees is only $14,500 and the average baby boomer has only $50,000 in retirement savings. The Fed has kept rates unchanged for 6Ys and 9 months at this point. Despite the boom in assisted living facilities the past few years, it is interesting to note that a study by Philips and Georgetown University finds 91% of people prefer to continue living in their homes after retirement. Regulators expect directors to do the following: be involved in the strategic plan of the bank; participate in board meetings; read the various reports reviewed at the meetings; supervise bank management; know the bank's financial condition; establish policies that provide controls and limits on the various risks a bank faces; monitor those risks, through periodic reports, to ensure they remain within acceptable ranges; and oversee bank management to ensure it operates in the best interest of the shareholders and other stakeholders (e.g., employees, customers and community). Community bankers may be interested to know that the Wall Street Journal reports nonbank trading firms now account for 60% of Treasury trading vs. 45% in 2012. A survey by Center for Financial Services Innovation finds 57% of consumers say they struggle to meet their day to day financial needs.